The Banyan Tree Al Wadi is the first resort in the United Arab Emirates to offer an all pool villa concept, in addition to an impressive 3,000 sqm hydrotherapy spa, private beach club and access to the Al Hamra 18 hole championship golf course. The resort stretches over 100 hectares and includes a dedicated nature reserve – home to local camels and Arabian Gazelles. 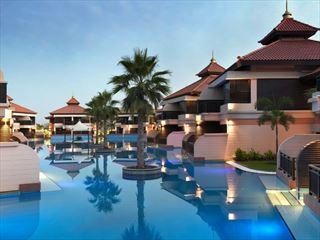 Another unique feature of this resort is its brand new Beach Club with 32 luxurious Beachfront Pool Villas. Guests can reach the Beach Club following a 20 minute chauffeured drive from the desert resort and a short trip in a traditional Dhow boat. The Beachfront Pool Villas have direct access to a private beach, covered gazebos and plunge pools. 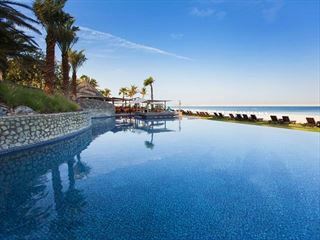 Each Deluxe Pool Villa are an impressive 158 sqm and have dramatic views of the surrounding desert. Designed with Arabesque themed doors that open into a wide walkway the leads to a walk in wardrobe and high ceilings that add a touch of luxury. Each villas is complete with a picturesque garden and private pool deck. The Al Khaimah Tented Poll Villas are set within the surrounding desert at an impressive 253sqm and come complete with day beds, sun lounges and a private plunge pool.a picturesque garden and private pool deck. The Al Sahari Tented Pool Villas offer a romantic hideaway for guests and a hightened sense of being, all beautifully designed with traditional antiques and artwork. Another unique feature of these villas are the dedicated spa treatment rooms and private plunge pools. Beach Club - located 20 minutes from the resort. Fishing, snorkelling, water-skiing, wakeboarding and sailing. Golf at nearby Al Hamra Golf Course. All Villas with private plunge pools. The resorts restaurant, Al Waha, serves international and local cuisine in a spectacular setting. 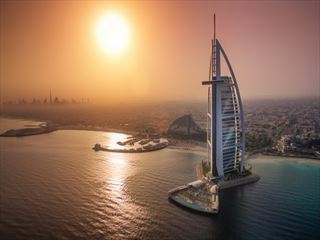 Diners can choose between eating indoors where floor to ceiling high windows create a dramatic backdrop against the surrounding sand dunes or on the outdoor terrace with Arabic grill and spit roast. Guests to Al Waha can enjoy sumptuous buffets and live cooking stations or the extensive A La Carte Menu.